I'm not totally sure what to say about this one. I finished reading The Breaking of Eggs and sat on it for a bit before starting this review. And still, I'm not sure. This book tells the story of Feliks Zhukovski, a Polish communist/leftist, who moved and "lived" in Paris. The story is set in 1991, after the fall of communism and Feliks is left grasping at the straws of broken ideas. The Berlin Wall has come crashing down and, along with it, come Felik's false interpretations of what his past history truly is. And could it be possible for me to identify any more with Felik's love of rules and regulations?! I think not. I think that last paragraph is actually a perfect example of the writing you will find in this book. It offers a perfect description of a feeling, but it can also go on a tad bit. Parts of the book made me think of Marilyn Robinson in its style. As a basic summary of the story itself, it is the realization of Feliks that life is not all that he thought it might have been, is everything that it is, and is incredibly unpredictable. It's a comparison between communism and capitalism and the exposure of the evilness of Stalin. Still, it is about valuing the things that you like about yourself and affirming the good in life that you see. While Powell goes along in this story/lesson though, he is also tossing out some foul language and there is a great deal of flippancy towards the sacredness of the marriage relationship, if you catch my drift. 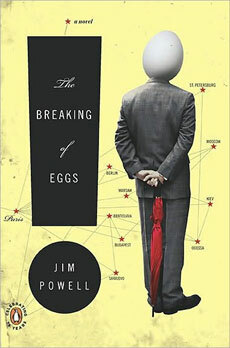 I DO have a copy of The Breaking of Eggs to giveaway if you think you might be interested in this read. How to win? Simply leave a comment below. As a fun twist - if your father or grandfather fought in World War II, leave a second comment for a second entry! This contest is open to U.S. Residents only and will be open through Tuesday, August 31st. I think I may feel the same way about this book as you do...struggle with some, but love the story. I liked how you ended the review with a final quote...very appropriate. One of my grandfathers did fight in WWII! Well, this definitely sounds like something I'd enjoy. Please enter me in this contest. I just found your blog by accident. I would love to read The Breaking of Eggs :) *Thanks* for the giveaway! My father was too young and my grandfather was too old, but my oldest uncle fought in World Ward II -- if that counts. Hmmm - I think I want to read this! I would like the chance to read this for myself. Who knows what I might think of it. My father, step father and my uncles served in WWII.